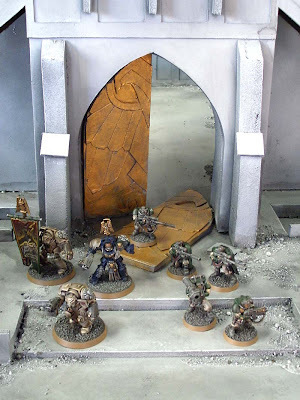 Image from GW. Very often, what we want is not what we end up with. For those who have been watching, the past couple weeks have seen me posting the progress of my Cities of Death Cathedral I started over a year ago. While it didn't take an actual year of work time to build, I did finally manage to get it completed. The WIP shots post is here. I will say unfortunately that I was not able to add all of the little details I'd planned from the beginning. I like to think that's for the best though. I had some great ideas, but they would have made the piece a bit more difficult to maintain and possible make it less gamer friendly. Lots of little details that would have broken easily you know. It would have ended up more like a diorama and less like a piece of terrain. In the end, I am happy with it, and I think the players that go out on a limb and use are happy with it as well. 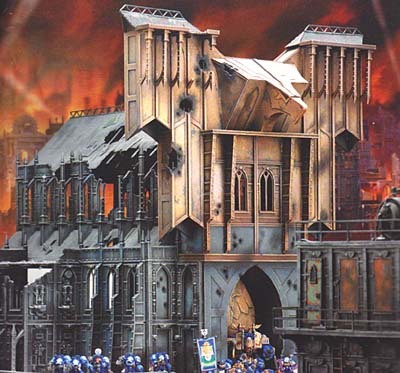 If nothing else, it's a great visual element that helps bring you into the 40k universe while you're playing your game. It's rested in it's unpainted state for a while at my FLGS in the back room and here it is painted. Enjoy the pics, you can click on any of them for a larger version. 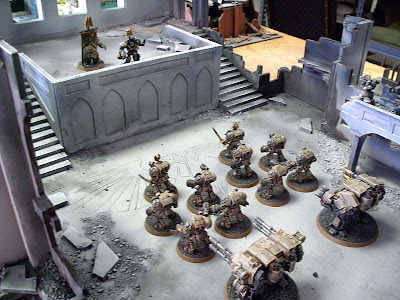 I used my old Deathwing army in the pics to give you an idea of the scale of this thing. Thanks for all the comments on this project folks. It's good to know things like this are appreciated. I'm a huge fan of using lots of terrain and I think it really brings the game to life along with fully painted models. You might be amazed to know that I've heard just as many people say it's (the cathedral) no good because of this reason or that reason as I've heard people say they like it. Goes to show you that you can't please everyone and you've just got to build what you think is cool and what you want to play on. thats awesome. 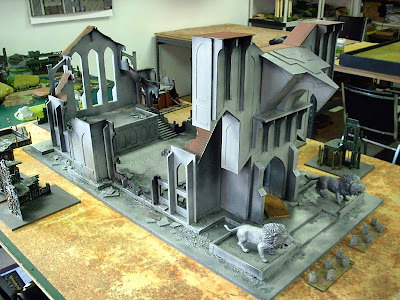 a fantastic terrain piece that actually looks like it would provide a decent (and dare i say balanced) game. really amazing work. I agree with the preference for heavier terrain and building to personal taste. As for the piece, I'm definitely one of the lovers! A semi-closed space of this size - almost an arena or a table within a table - and blocking line of sight and movement as it does, can only mean fun, especially with such a strong theme. I'm also impressed by the ambition of the project, and its actually getting finished! No small achievement. Thanks guys. I haven't had a chance to get a game in on it myself yet. but I know others have. I think it takes a certain kind of gamer to really appreciate the piece. Fantastic, I expect playing with terrain like that really brings the game to life! As a lore geek, I'll always take a terrain with more history, background, and character over an open field with some rocks on it. Even if it's harder to play on, I think you'll always enjoy and remember games played on better done terrain better than you will easy games played in open fields. I love this piece - I'd abosolutely love to have the chance to play on it. Absolute genius distilled, solidified and made to look like a ruined cathedral. Well done. Mordian7th: At the height of construction, it took up my whole basement work area. Maybe 8 feet wide by 10 feet across. I had junk spread out everywhere during construction. It was fun to build, but I don't see myself building another one. They are so time consuming it's crazy. Lovely work! How much time did it take to build it? Truely an inspiration for us all! How big is it in height? Teku: A few months overall and it's just over 20 inches tall at it's highest point if I remember correctly. Ron, that piece is pure awesome. Anyone who says otherwise is a douche and should be slapped in the face. The players at your LGS are lucky SOB's to have someone who is not only talented, but also actually willing to make such amazing terrain pieces for everyone to play on. I say they should buy you a beer a week for the next year! 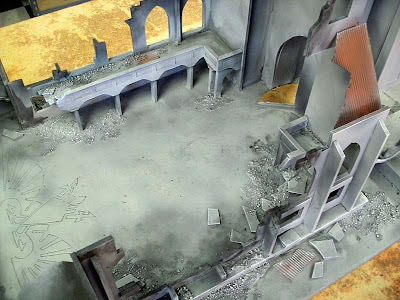 But I found that using elmer's wood filler (from Home Depot) works great as a quick and easy way to cover up bits and pieces on terrain and it looks realistic as far as when it comes to ruins and rubble. Best part - you can get a huge tub that'll last you forever for just $6. I wished I lived in your city just so I could play on that. That is a beautiful piece of terrain. Grats on finishing it and thank you for posting about it. After doing aaaaall that work scratch-building it to look similar to the GW version pictured, I'm really surprised you didn't try to get closer to that amazing original paint scheme. Got to say mate; that is superb. I shouldn't worry about the lack of details - perhaps you were a little too close to the project (as I imagine you would be with such a massive undertaking!). There's always a fine line between gaming functionality and aesthetics, and I'd say you've struck a near perfect balance with this. I rarely read blogs but I'd love to see some photo's of this being fought over. I love it. I really enjoy playing my 40k in some huge imperial ruins. This cathedral looks like a great center piece. That is simply superb. All the haters can go do inappropriate things to themselves. I want one. Hell, I want 27. Great work. Once again I have to commend you for the playability of the piece. 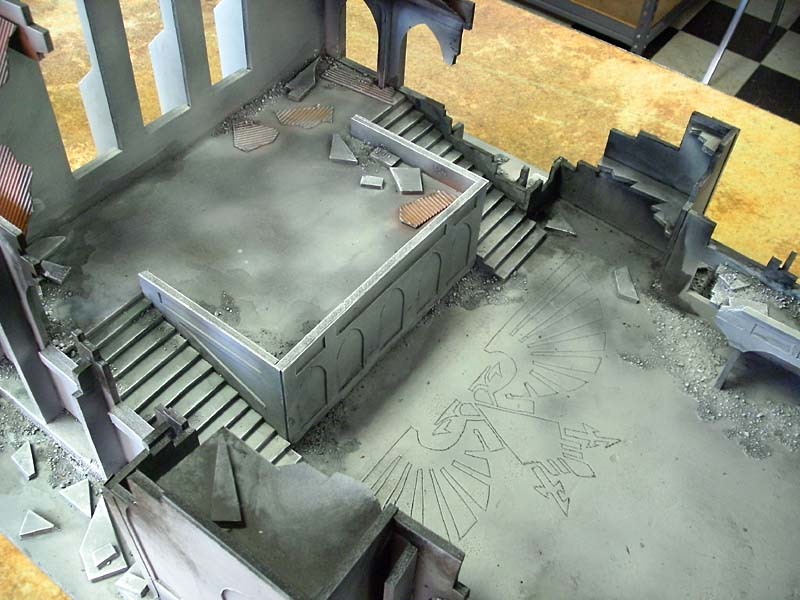 I would love to see any battle reports the guys at the FLGS might have fighting over this piece of terrain. I think the level of detail is just right as it lets you focus on the models inside the terrain and the vast majority of the area is playable. 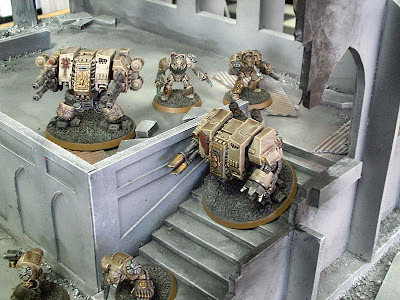 The bits and pieces of rubble on the ground are sparse, but give the sense of a ruined building without the precarious model placement required by some overzealous rouble placers. 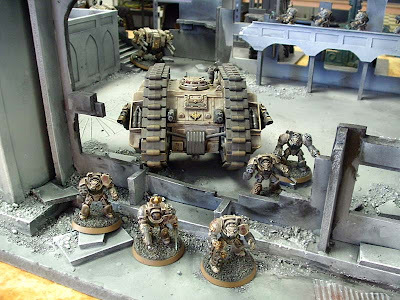 As someone who has built a LOT of terrain (some good, some bad, some ugly), I find this pieces to be an excellent balance between "playable" and "diorama". Thank you for documenting the process on your blog. Christ almighty, this is a successful piece of modelling that deserves all our praise. I do have second thoughts concerning detail. 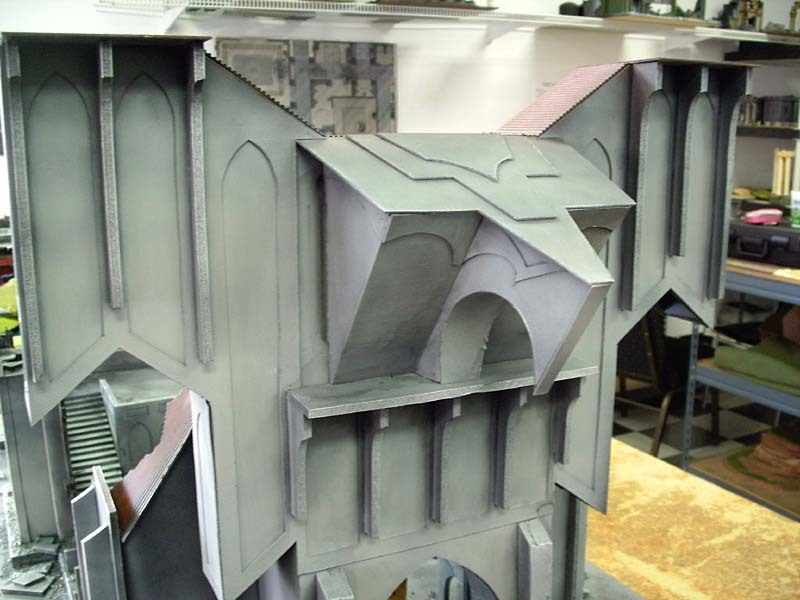 Mostly the lack of much iconography on the piece of terrain (Them gothic sci-fi builders on speed are sure dedicated, don't you agree?) You know, statues, an altar in the cathedral, that sort of stuff. To compensate, of course, you made this huge piece ominous and eye-catching enough to be a true tabletop centrepiece. I congratulate you. Lol I played a Game of Malifaux on that a few weeks ago after it came out of the back room. I was wondering where it went to. Honestly folks, thanks for all the positive feedback. For those who mentioned the lack of detail. I understand. It was a balance. Playability came first in the project. I would have liked to have added a number of additional details, but time and making the piece so delicate it couldn't really be enjoyed became issues. I cut out so many things in the end. It's playable and it will stand up to the wear and tear of regular gaming as it stands now. If I were building it for my own collection (read display), I could have gone in and added all kinds of things without fear of them getting broken in use. But again, it would have changed from something you're not worried about using to something you're too scared to play on because you're afraid you'll damage it. 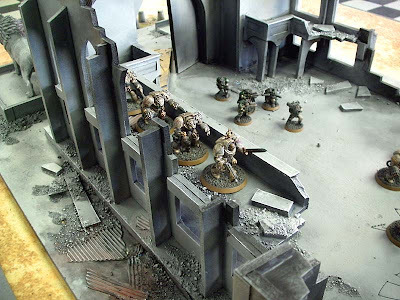 Awesome piece of terrain. I may make a special trip down just to see this. the Other Kevin: Thanks. I'd offer to play you on it, but I have no army as of now. But one day when you've got nothing to do, come down and visit the store. 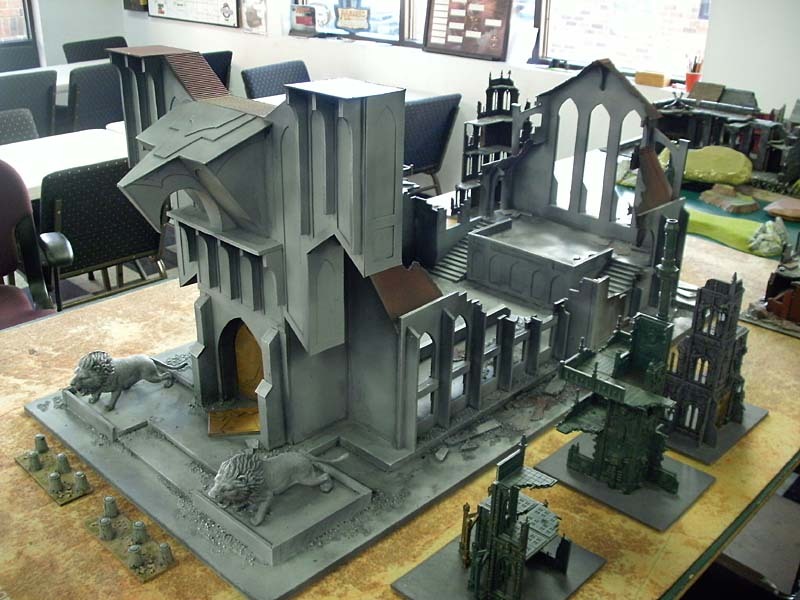 This is one of the coolest 40k Terrain pieces I've ever seen. Sure, the concept had lots of neat details. But, it was much smaller. And yours is a very accessible approach to creating massively dramatic models. Finally, it looks so playable -- the type of terrain piece that MAKES GAMES. You actually can fight through it, and that's way cool. Great job. Steve: Thanks. I hear it gets lots of use at the store so I'm happy to know that people are using it instead of just looking at it on the shelf. Hi Ron, this thing is pretty amazing! 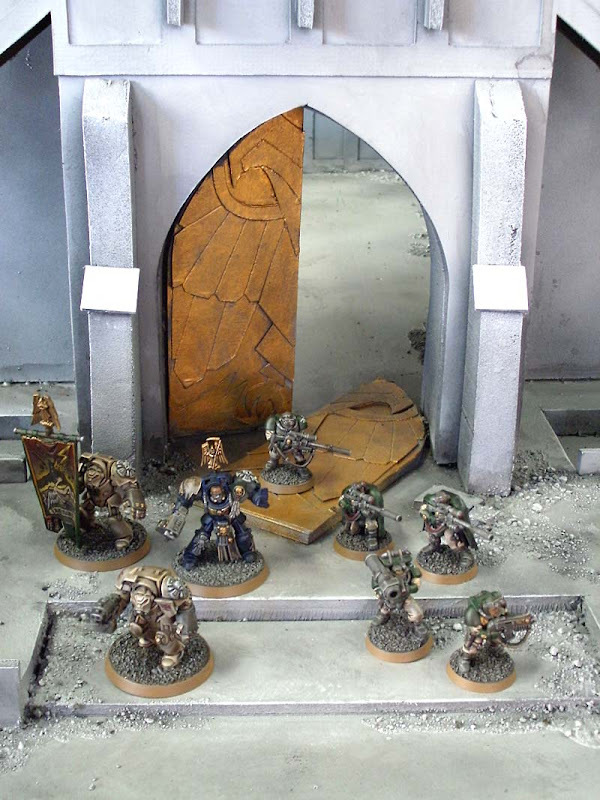 Did you paint the base masonite before gluing or after? I'm building something similar in size, but I'm worried the 1/4" mdf base I want to use might be too flexible to support it and it will flex and rip/break the foamboard, or at least lift it from the glue. Ghostin: Thanks! The base is actually a 1/2 inch thick piece of smooth particle board. Any thinner and it would not hold up with the weight on top of it. It still bends slightly when you pick it up. I think it was a shelf or something like that in its original life. But to answer your question, I painted everything in the end after I'd built it all. Ghostin: I didn't go as far as gorilla glue on mine, but I used tacky glue which is basically white glue but not as runny. It helps with holding the parts together as they dry. And I used lots of it too. It's amazing how much you go through building something like this.